Cool the baked potato just slightly and then cut the baked potato in half lengthwise and, scrape out the flesh by dragging a fork along the potato, so that you get a fluffy texture. Measure out 1/2 cup and set aside. Measure the flour, baking powder, salt, and sugar into the bowl of a food processor. You can also use a pastry cutter and a wooden spoon. Pulse to combine. Add in the butter and pulse about 10-12 times to combine. Then add the sweet potato and pulse once or twice more. While pulsing, drizzle in the buttermilk, The dough should just come together as you finish adding the liquid. Turn the dough onto a floured surface and bring it together, kneading a couple of times. 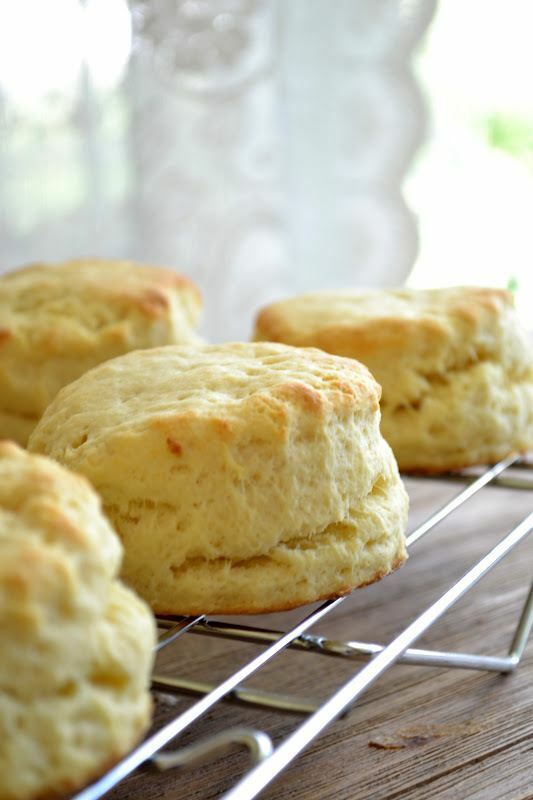 Pat out into a nice plump 8 inch round and cut out your biscuits with a biscuit cutter. I used a 2 3/4 in cutter for large biscuits. You will have to re-form the dough to make the last few. Try to work the dough as little as possible. Place on a baking sheet (I always use a silpat mat or parchment paper.) At this point I put the whole tray in the freezer, or if it won’t fit, the refrigerator, for about 10-15 minutes while I clean up. This insures that they’ll spring up nice and tall in the hot oven. Bake for about 12 minutes, until risen and pale golden. Cool slightly on a rack before devouring. To make the gravy, brown the sausage in a skillet, breaking it apart as it cooks. When the sausage is completely browned, sprinkle in the flour and cook for a minute. Add in the milk, whisking as you go, and stir until thickened. Add pepper to taste and let it bubble away gently for a few minutes.